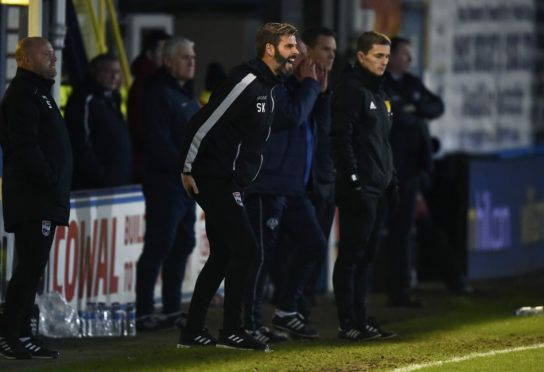 04/01/19 LADBROKES CHAMPIONSHIP MORTON v ROSS COUNTY CAPPIELOW - GREENOCK Ross County co-manager Stuart Kettlewell on the touchline. Ross County co-manager Stuart Kettlewell has been handed an immediate three-match ban with a further three games suspended following a Scottish FA hearing at Hampden Park. Kettlewell was served with a notice of complaint and accused of breaking two disciplinary rules during the 1-0 defeat to Morton at Cappielow on January 4, with the 34-year-old charged with misconduct and making physical contact with a match official in aggressive manner – believed to be fourth official Craig Napier. Kettlewell was sent to the stand in the latter stages of the game following a flare-up with Morton’s Chris Millar, who was booked along with County’s Michael Gardyne. A club statement said: “Our manager Stuart Kettlewell attended the hearing in person this morning as he took the matter very seriously, he has admitted the conduct allegations and is keen to move forward with the club and learn from the experience. Although three of Kettlewell’s matches are suspended until December 31 this year, the Staggies co-manager will now miss Monday’s Scottish Cup Highland derby against Caley Thistle, as well as the Staggies’ IRN-BRU Cup tie against East Fife and their next Championship match away to Partick Thistle on February 23.